Abstract：The effects of different oil extraction processes on the migration of aflatoxin and aflatoxin removal by removing peanut red skin were studied. The results showed that by solvent extraction, about 3% of AFB1 and AFB2 migrated into the oil, and the remaining 97% moved to the meal. 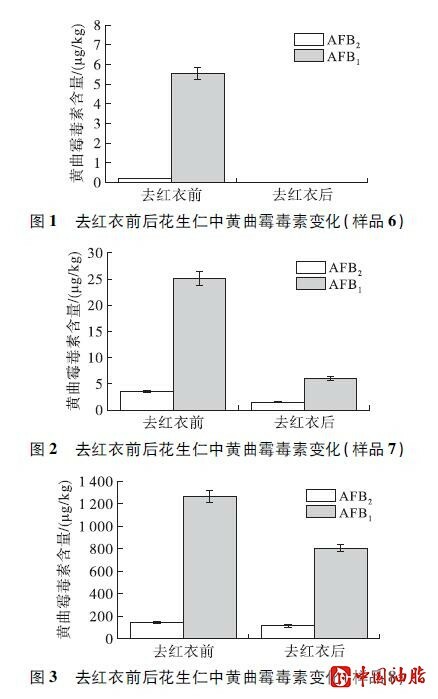 about 10% AFB1 and 0.1% AFB2 migrated to the oil during aqueous enzymatic extraction, and 69.25% AFB1 and 77.70% AFB2 migrated to the liquid phase. about 10% AFB1 and AFB2 migrated to the oil, and the remaining 90% moved to the cake when peanut was pressed. The removal of peanut red skin had a great influence on the aflatoxin reduction rate when aflatoxin content in peanut was lower, while the removal of peanut red skin had little effect on the aflatoxin reduction rate when aflatoxin content was higher.